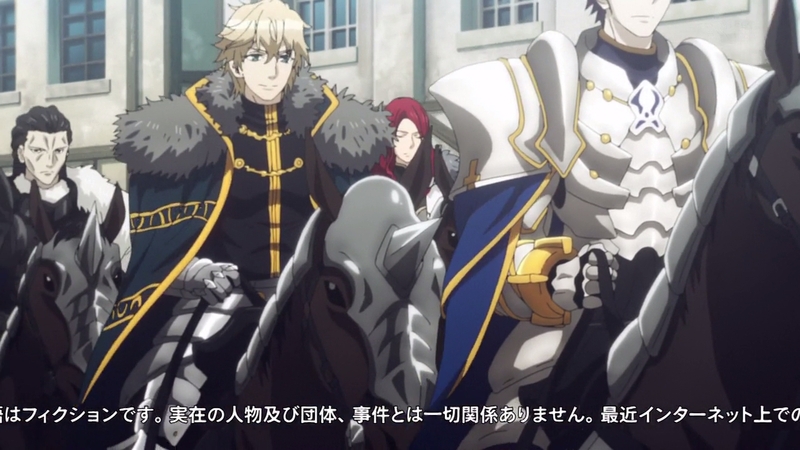 The focus has shifted back to the Great Grail War itself after some time spent with Jeanne and Sieg, which naturally entails the return of the show’s prominent action sequences. The trend of notable industry figures coming along to help is going strong, too, so let’s see how their craft influences things this time around. — It’s quite ridiculous how much guest star power this show is building up. Takuya Igarashi’s appearance as storyboard artist last week was an impressive feat already, so I suppose it only makes sense for it to be followed by someone with as much name value as him: Yasuhiro Irie. The famed director of Fullmetal Alchemist: Brotherhood and Scorching Ping Pong Girls did mention a few days before the show began airing that he would be turning up at some point, making it less of a surprise than Igarashi’s appearance, but two high profile people (both with BONES links too!) being slotted in one after another is always nice. If I were to be completely honest, I would have preferred for Irie to handle an episode that let him take advantage of his prowess with action scenes more, but that’s just me nitpicking. — I’d be excited over Saber’s appearance in Mordred’s flashback, but well…they don’t quite afford the luxury of that by nature of the scene. On the other hand though, it’s interesting seeing her portrayed from perspectives we wouldn’t otherwise see in previous Fate entries. 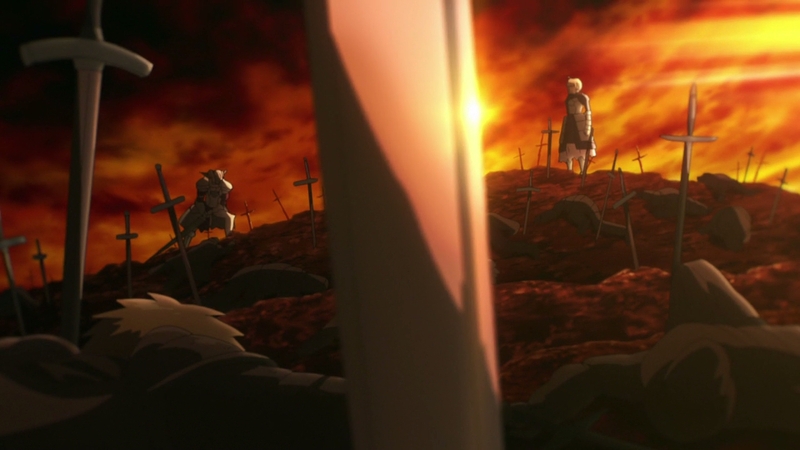 Incidentally, I feel this is where Irie’s storyboard stands out most, particularly in the use of Excalibur as a divide between Mordred and Artoria. It ties in well with both the latter’s claim that Mordred was never fit to be king and the former’s wish to challenge the sword in the stone ritual and prove herself. 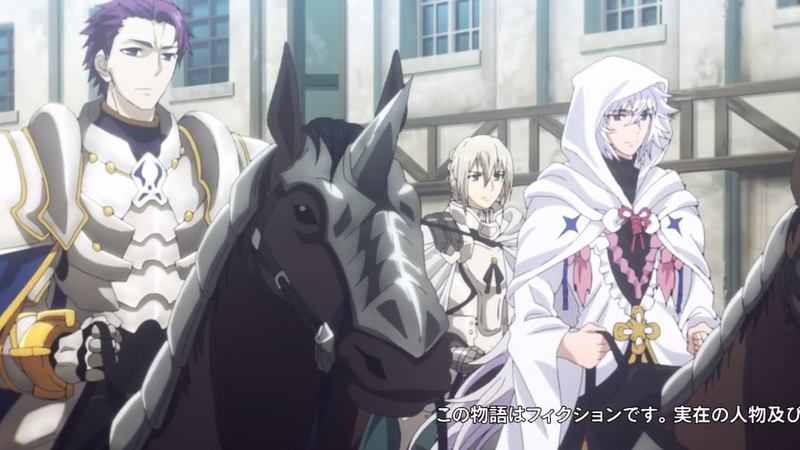 Also, seeing both Merlin and the Knights of the Round in anime form in a scene completely inconsequential to them made me laugh a bit. 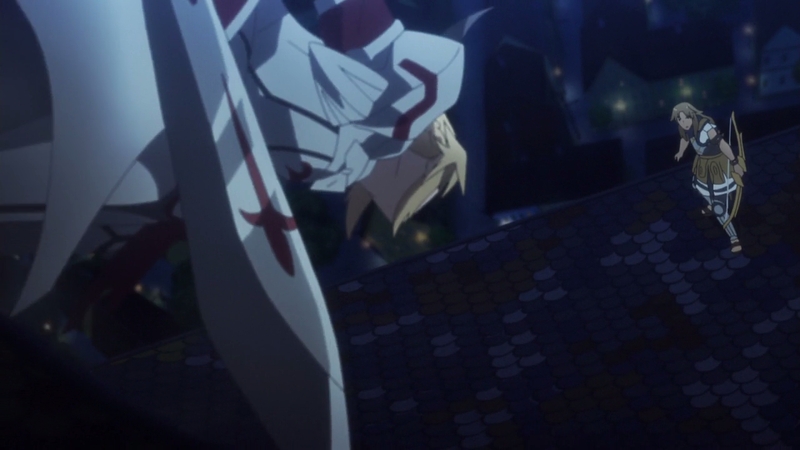 — Here it is, the most important scene in the entire episode: a wonky Mordred engaging a cat in a clash for the ages while Shishigo discusses unimportant murder cases with Waver. Mordred and Shishigo seem to be a favourite among the staff based on their comments – albeit not as much as the shining star Astolfo – and this scene is 100% Irie and co. having some fun in relation to that. Some might complain that it’s a bit too silly, but these sorts of antics are perfectly in-character for Mordred, so I’m all for it! 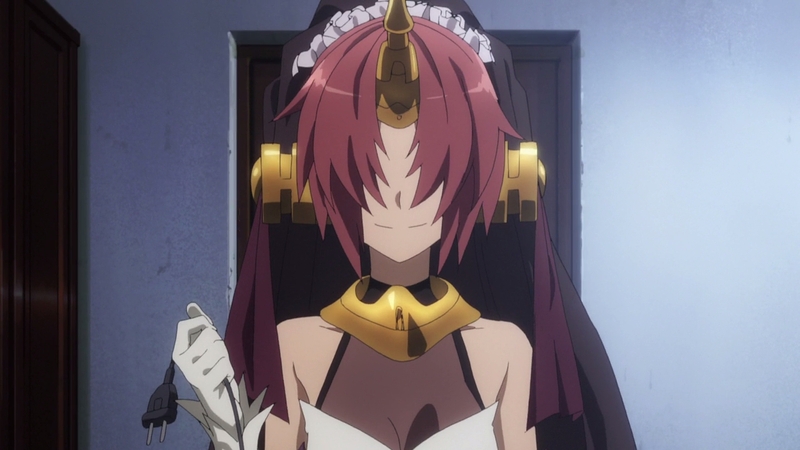 And while we’re talking about endearing servant characterization, Fran is a smart Berserker who knows how to unplug computers well. 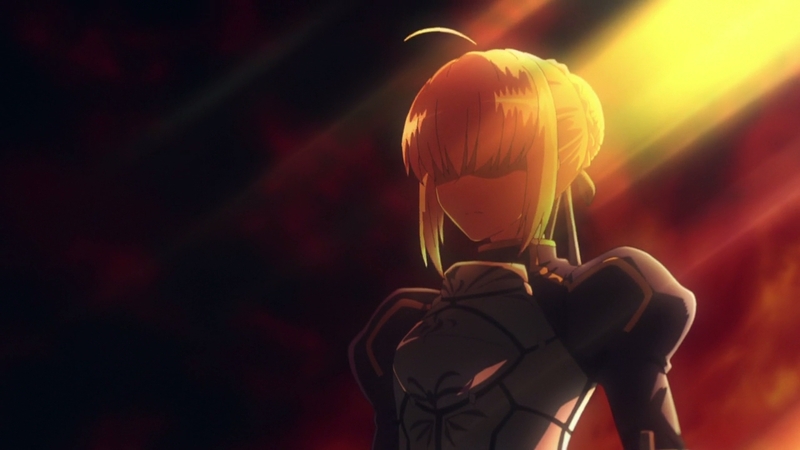 — Mordred dispersing the smoke created by Jack the Ripper is a neat concept for a scene…in theory, that is. Unfortunately, the actual moment was butchered by both the return of ghosting and the show’s intrusive and kinda ugly digital effects. There are many talented people working on this series, but sometimes the combination of poor decisions and unfortunate circumstances prevent the result from being as good as it should be. And as a side note: Tange Sakura voicing a small, crazy serial killer is proving very difficult to get used to after my brain has linked her to Cardcaptor Sakura for so long. 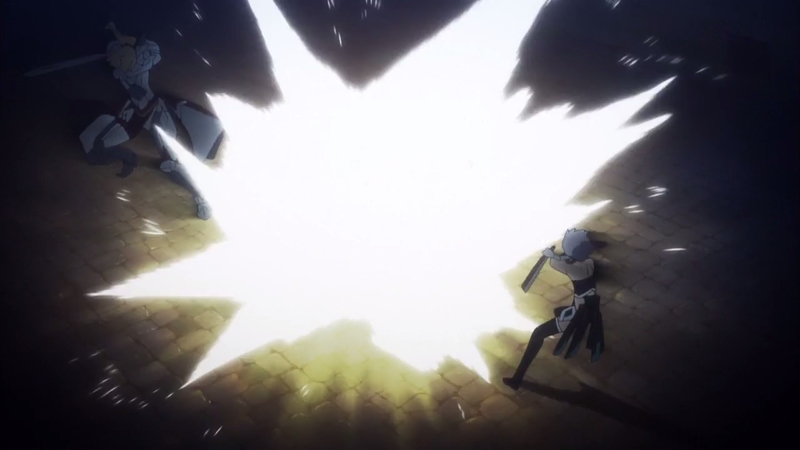 — I stopped pointing out the use of impact frames considering how prevalent they are throughout the show, but they really do like to sneak them in as much as possible. — There’s a handful of exciting moments in Mordred’s chasedown of Chiron to punish him for camping and the latter’s retaliation. Irie gets to shine here again by drafting a rather ridiculous sequence: Mordred rushing up the tower while deflecting Chiron’s arrows is cool on its own, but there’s a neat sense of depth to the cut of her delivering a quick slash as she reaches the top before landing on and skidding further into the foreground – and you should know how much I love that skidding after last week’s post! Following that is Chiron’s landing after he jumps off the tower, which may well be my favourite piece of animation in the episode. The movement and timing takes care to show the finesse with which he absorbs the impact of the landing itself before dropping his bow and assuming a new stance, which caught my eye almost immediately. Finally, we have Toru Iwasawa’s return to the show after his noteworthy work on episode two. 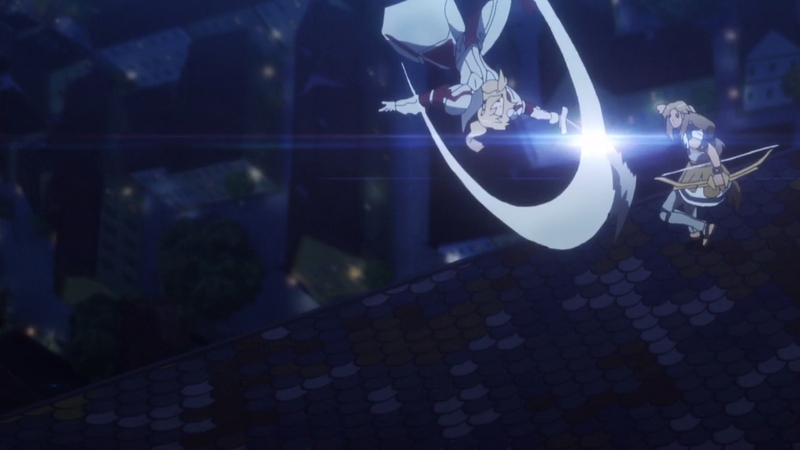 It’s actually pretty impressive how he still manages to show off Mordred’s lightning fast speed for only an instant as she shoots down the tower towards Chiron, only to be countered with his Pankration. His comment about his work on Twitter only mentions the Pankration part, but it’s also rather vague overall, leading me to assume that he might be responsible for everything from Chiron’s landing to the end of the scene. 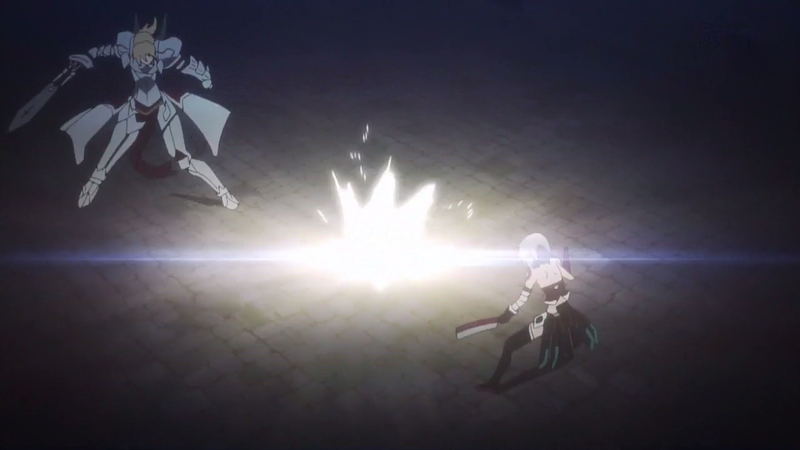 — Shishigo and Fiore’s square off felt more like a minor scuffle in comparison to Mordred and Chiron, but Satoshi Sakai – who stood out a fair bit during his recent run as action director for SukaSuka – gave it special flair, making the attack more menacing with some degree of loose morphing. 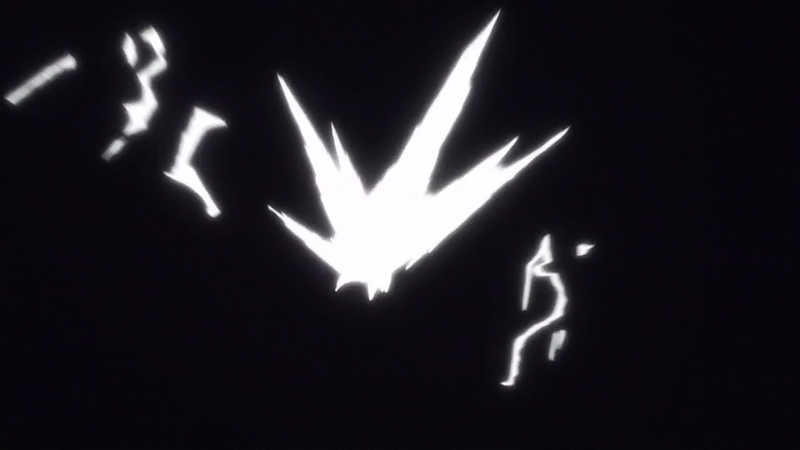 Also oh my god I only just noticed that the bullets for Shishigo’s gun are fingers.